THIS ALL-IN-ONE CLEANSER DISSOLVES IMPURITIES, Make-Up and Excess Oil... without Detergents. Smoothes and tones without stripping skin. Most skin cleansers and soap contain harsh detergents…that can strip the protective acid mantle of skin... leaving skin imbalanced, irritated, and dull-looking. Cleanses gently and effectively with natural cleansing agents that balance, restore, nourish and effectively cleanse dirt, pollutants and dead cells from skin. L’ATHENE brings everything the skin needs for maximum health and radiant beauty. Each product contains 100% pure pharmaceutical-grade natural ingredients. It’s rich, luxurious cosmeceutical skin care treatments are targeted for minimizing the signs of aging. Sold in doctor’s offices, hospitals and spas, L’ATHENE’s chemical-free, all-natural formulations provide your skin with the highest levels of nutrients, resulting in youthful, beautiful skin. L’ATHENE’s products are power-packed with proteins, fatty acids, phyto-nutrients, healing herbs and essential oils for extraordinary results. For more information on L’ATHENE, please visit www.lathene.com. You have to tell us in your comment a few things about your favorite facial cleanser / cleansers and why you would like to win this Anti-Aging Facial Cleanser from L'athene. You should also fulfil any one of the conditions (rules) from (1) to (8) and mention that in the same comment. Commenting on the post by fulfilling at least one rule and with a valid email address or your twitter id is absolutely necessary to let me know what you did to enter this contest. Leave links wherever applicable. Also remember that without fulfilling the mandatory requirements, all other entries will be considered invalid. For extra entries, leave separate comments for each entry to increase your chances of winning. The giveaway ends on March 2, 2011 and is open to entrants in the 50 United States only. One lucky winner will be chosen through random.org and the results will be announced on March 3, 2011. My favorite cleanser is Dermalogica's Clearing Skin Wash because it has helped stop me from breaking out. I'm also a weekly email subscriber. My skin cleansing routine is pretty eratic. I always clean with a wash cloth and warm water and a couple of times a week I use an exfoliant wash. My skin is very sensative and most products leave me red and itchy. I am looking for a cleanser that will clean without any bad side effects and this Facial Cleanser from L'athene sounds like it might do the trick. I use lots of different products but concentrate on lotions and moisturizers with spf for my fair skin. I love Kiehls, Kinerase and some of the Olay products. I am willing to try anything new that works. Currently, I use many different facial cleansers because I haven't found one that suits me! I "Like" Beauty and Personal Grooming-A resource for natural beauty tips on Facebook! 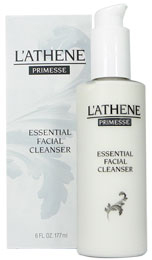 I would like to try L'athene cleanser since it's non irritating. The cleanser I currently use is Origins Checks and Balances. I like that it is gentle on my sensitive skin. It cleans without any irritation that a lot of other cleansers cause. I'd like to win this, as I currently use a separate makeup remover. This would really streamline my routine! I usually just rinse my face with hot water. When I use soap, I just use regular bar soap. So, you see why I need this product. I publicly follow your blog with google friend connect and my favorite cleanser right now is by Shiseido because it is very gentle. I would love to win this one because I've never used an anti-aging cleanser before but it's definitely about time I started! I like Paula's Choice combination skin cleanser! I like to use St. Ives Apricot Scrub a couple of times a week. It really works well to freshen and exfoliate my skin. I love Apriori Celloxylin Creme Cleanser for daily use. I am interested in this cleanser because of it's anti-aging benefits. I like Shiseido foaming cleanser and their toner because it rinses off clean and feels good. But I would love to try this product, it sounds great. Just subscribed to your weekly email. I wash my face with whatever I am using for Shower Gel and Skin MD Lotion after. So I could really use L'ANTHE which is made for the face. It's important for my cleanser to not have harsh detergents that dry my skin. I use Oil of Olay facial wash but would love to win this. I need the anti-oxidant properties and something that won't dry my skin. Public Follower of your blog as nightowl. I Like the Beauty and Personal Grooming-A resource for natural beauty tips. My favorite cleanser is Skyn Iceland Glacial Face Wash. It cleans well - especially with my Clarison. I use the transparent Neutrogena facial bar, but it does dry my skin somewhat, so I would love to try L'Athene for more balance. I use a wash cloth and water to clean my face most of the time and an exfoliator a couple of times a week. My skin is sensative and I have yet to find a cleanser that didn't irritate my skin. This facial cleanser sounds like it just might be the ticket for my skin. I like st ives facial peel and scrub. They make my skin feel so clean. I'd love to try this because I love trying new beauty products in hope of improving my skin. I am a lotion and potion junkie so that is why I would like to win. I have never tried this brand and I'd be curious to see how I like it. In general, I really like a ncie scent and a clean finish in a cleaner - nothing too overdrying or greasy. Thanks for the chance! FOLLOW ON GFC AS "kytah00"
Luxiva Facial Cleanser by Merle Norman has always been my favorite. I like a cleanser that makes me feel CLEAN afterwards, not one that leaves a film afterward. im not very picky about cleansers, they have to be inexpensive but for sensitive skin. I'd like to win this cleanser because it sounds extra gentle. I use a cleanser by Clinique which is very mild. I am looking for a natural cleanser. I use a cleanser by Clinique. Right now, I am using La Isha Gentle Aromatherapy Face Wash for Dry Skin-it is lovely, and smells great, but doesn't have anti-aging properties, which is why I would like to try this product. I subscribe to your weekly updates. right now i use a garnier cleanser, i like that it's not too soapy and easy to rinse, but really cleans my face. i really want to try this cleanser because it sounds like a real high quality product!